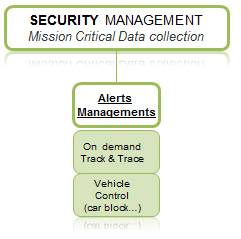 With the monitoring box installed in the vehicle, its every movement is transmitted by GPRS/GSM to the server. In real time, you can see displayed on maps or on management panels the exact location of the vehicle, the route taken, its speed, distance travelled, direction followed, etc. The maps supplied by our partner Teleatlas are frequently updated and, in addition to the real-time location display provided by Telefleet, you can consult your vehicles movement histories. Alarms can be transmitted to specific persons or applications by e-mail or, SMS or within third applications by XML (control centres, etc.). identify and respond quickly to all anomalies.